I posted before about being underwhelmed by Big Boy’s new burger line. I had said that they need some new ideas to really stand out in the world of higher end restaurant hamburgers. Well, they must have heard me or something, because on my most recent trip to Big Boy I discovered they’ve introduced a burger to end all burgers. The Kitchen Sink consists of a patty, lettuce, tomatoes, pickles, red onion, red relish, mayonnaise, American and pepper jack cheeses, bacon, chili, French fries, and a fried egg. It was such a daunting prospect that I required some convincing from my brother, but in the end I realized that this is the kind of sandwich I got into the business for, and good or bad, I needed to cover it. And believe it or not, it turned out to be pretty good!! I know I have a soft spot for excessive burgers, but there’s a lot going right for the Kitchen Sink. The chili, fries, and egg all work together well for a hearty, filling burger. As you work your way inward, you begin to reach the more traditional toppings, but the red relish and pickles lend it a sweeter, tangier twist. It’s a lot of food, but all of the ingredients work together harmoniously enough to keep you engaged. I would’ve liked more French fries included, as I think potatoes are an underused sandwich element, but overall I was floored by how well a burger which seems like a dare worked. The Kitchen Sink runs for about $9, which is kind of a lot. But it’s definitely worth getting, especially to impress your friends. 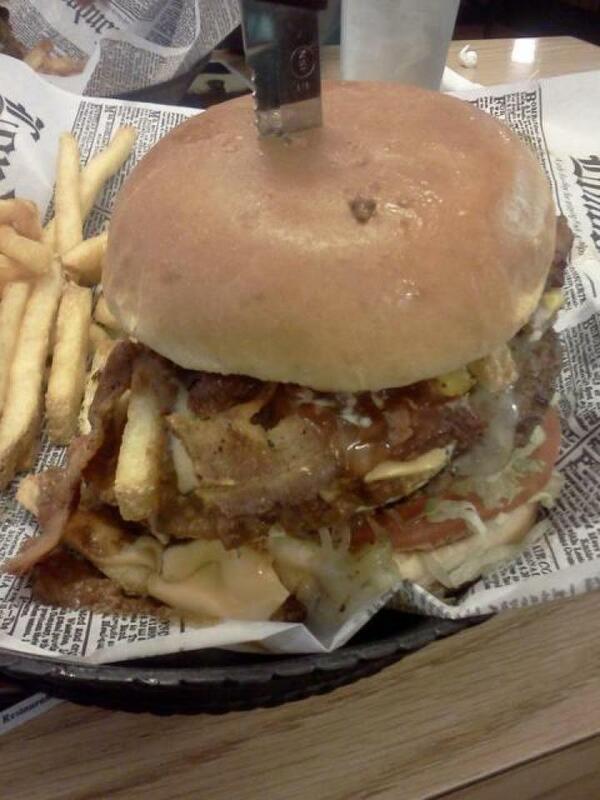 The chili, egg, fries and bacon combo alone is fantastic, and there’s another burger’s worth of ingredients besides. 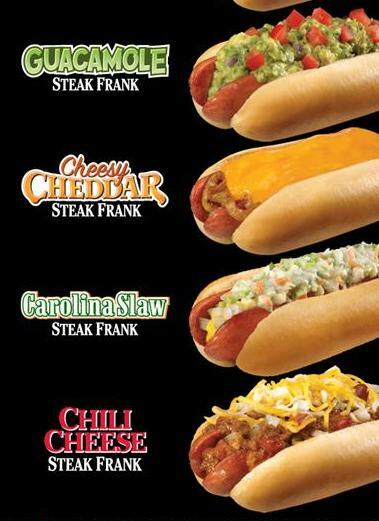 A while back, Steak ‘n Shake introduced a line of hot dogs topped with various cheeses, sauces and other stuff. They’re not unlike their regionally themed burgers in terms of ingredients, and come with fries and a drink. I’ve been dragging my feet on trying one. Hot dogs aren’t a super high quality meal, and while they’re a staple of ball parks and food courts, the idea of going out to eat and ordering one over a burger doesn’t seem too appealing to me. I finally bit the bullet and decided to try the Carolina Slaw. And I’m really glad I did. If you’re going to order a hot dog from a restaurant, Steak ‘n Shake is the place to do it. While “signature steak franks” sounds a bit grandiose, but this is actually a genuinely high quality, tasty frank. The Carolina Slaw’s hook is the addition of cole slaw and mustard. It’s good cole slaw, and there’s plenty of it. It adds a nice texture to the dog, and is light enough that it doesn’t overpower the meat. All in all it’s a clever idea executed well with top shelf ingredients. The Carolina Slaw, like other steak franks, runs for about $4-5 as a combo. I’d definitely recommend the one I tried, and would be willing to try another one. Like I said before, it’s rare that I recommend a hot dog from a restaurant that serves other things, but this is one to try.